Find related stories on NSF’s Critical Zone Observatories Sites. Find related stories on NSF’s Long-Term Ecological Research Sites. With fierce winds and flooding rains, hurricanes can be disasters for people — and for ecosystems. These devastating storms have major effects on tropical forests, demolishing tree canopies and leaving behind debris that piles up in watershed streams and on forest floors. Scientists at the National Science Foundation (NSF) co-located Luquillo Critical Zone Observatory (CZO) and Long-Term Ecological Research (LTER) sites in Puerto Rico spent the past year evaluating the impacts of Hurricane Maria, a powerful category 5 storm that struck Puerto Rico head-on in September 2017. The researchers reported their results today at a press conference — Puerto Rico one year later: Hurricane Maria’s lasting footprint — at the American Geophysical Union fall meeting in Washington, D.C.
After Maria, sensors measuring nitrate in streams at the NSF Luquillo CZO site showed a dramatic increase in how much of the nutrient was transported from mountain headwaters to the sea, according to biogeochemist William McDowell of the University of New Hampshire. Nitrate is essential for plant growth. In large quantities, however, it can be harmful to coastal ecosystems. After major hurricanes like Maria and the tremendous changes they produce in vegetation, nitrate escapes from damaged forests and is flushed downstream, says McDowell. “The implication of the loss of nitrogen from an ecosystem is uncertain,” says McDowell, “but is likely to play a role in which trees grow back first.” The downstream delivery of nitrate to coastal waters may also fuel algae blooms and, eventually, coastal dead zones. 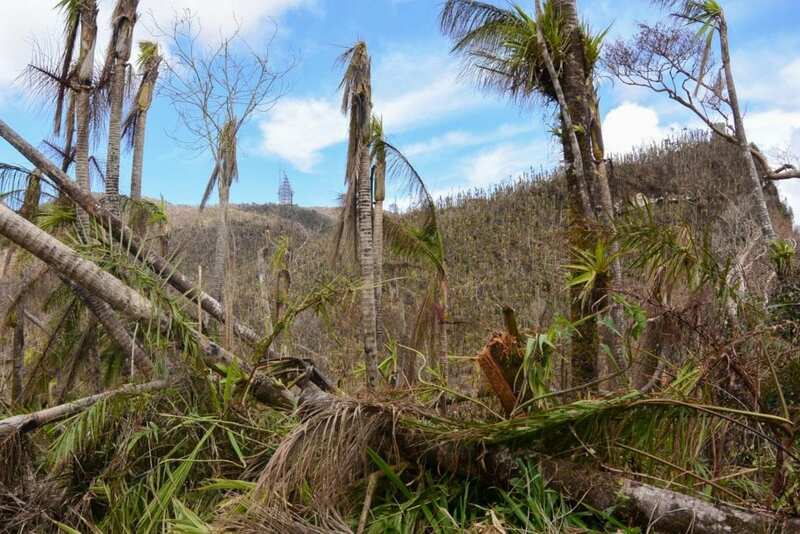 Based on data collected at the NSF Luquillo LTER site, Hurricane Maria killed twice as many trees as previous storms and tripled the number of broken trees, found ecologist Maria Uriarte of Columbia University. Palm trees were the exception; their sinewy stems bent in the wind and their fronds began to grow back almost immediately after the storm. Future storms of Maria’s strength could switch the dominant trees in Puerto Rico’s forests from tall hardwoods to palms, Uriarte says, with consequences for whether forests take up more carbon or release carbon into the atmosphere. Their studies at Luquillo address long-term climate patterns, disturbances such as hurricanes and landslides, and the legacies of land use history in forest and stream ecosystems. By understanding how nutrient cycles — and plant and animal populations — respond to natural and human disturbances, scientists can supply the information needed to model, manage and conserve tropical forest ecosystems. study such subjects as mineral weathering, nutrient transport, and changing water, dust and sediment inputs to the ecosystem. NSF Luquillo LTER research includes long-term observations of species and ecosystems; the connections between forest and stream ecology; and the ways mountains and precipitation interact. Experiments simulate the effects of hurricane intensity on forest and stream ecology.